You are here: Home › News & Press › Global News archive › What will banking be like in 2025? 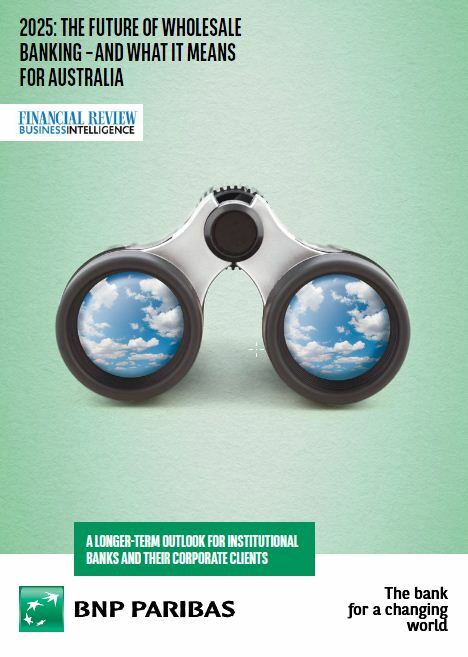 What’s ahead for the country’s financial institutions and their corporate clients over the next decade? Ten years ago iPads and iPhones were still a year or two away from launch and Facebook was restricted to Ivy League students while markets were in an economic boom that was ultimately on borrowed time. What will come next for the industry? As Australia’s oldest major foreign bank, we at BNP Paribas asked leaders of the nation’s banks and corporations what they see as the key longer-term issues in its study 2025: The Future of Wholesale Banking – And What It Means for Australia. They will better harness technology to be more productive. 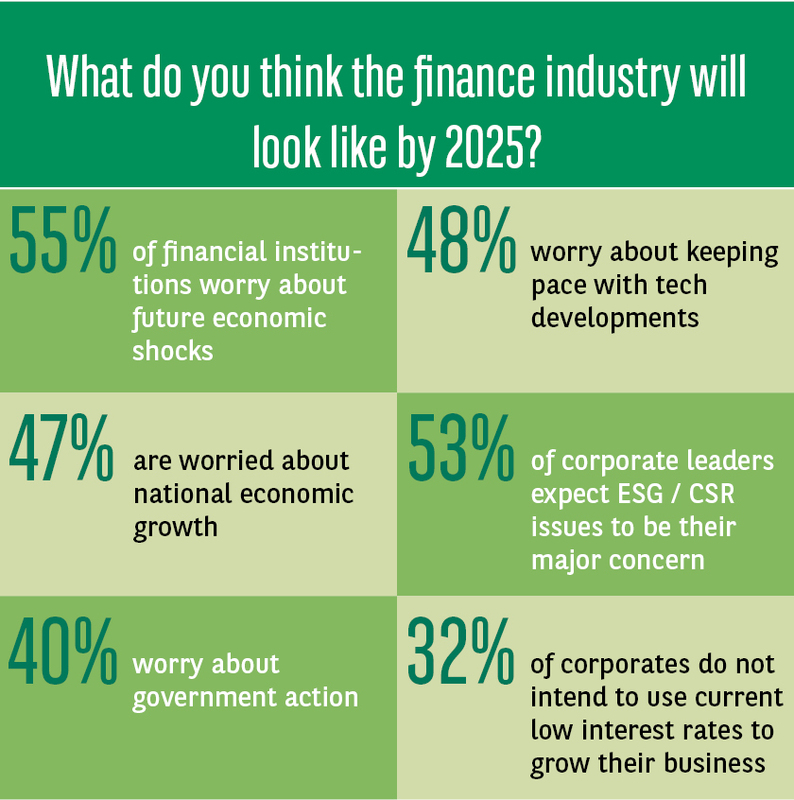 Our research revealed that the financial sector expects more economic shocks: it is their greatest single concern (55%) between now and 2025. This is followed by delivering sustainable returns to shareholders (49%) and keeping pace with tech developments (39%). In contrast, corporate leaders expect environmental, social and corporate governance issues (including climate change) as their biggest concern (52%) over the next decade. This is followed by keeping pace with tech developments (48%). indirect self-service for the wider market, with the latter enabled by technology – both existing and yet to be developed. Technology also looms as a major concern, as well as an opportunity, for many in the finance industry. The sector realises it needs to harness technology for product delivery and distribution, as well as using data better. Another major industry concern is the impact of rising competition from IT players expanding into the financial sector. But it is not just technology that will be the ultimate disruptor. Rather, it is the engagement and relevance models that new providers offer that differentiates them from traditional financial institutions. As such, improving engagement will become more of a focus over the decade and key to long-term success for all organisations. The research revealed that the main product development focus for financial institutions over the next decade is expected to be on serving the country’s ageing population, in particular developing products that provide income streams for retirees. An overwhelming 86% of institutions expect it to be a growth area for their organisation between now and 2025. This reflects the demographics of the nation’s ageing population. As an increasing number of Australians near retirement their income stream will become a priority for them and more retirees are expected to consider their assets at retirement as an investment pool that can generate ongoing income – on its own or as a supplement to any government-funded pension. Respondents believed that equity and retail investment products are expected to have less focus in the future and, surprisingly, residential investment property lending and small business lending was also towards the bottom of the ranking of where financial institutions expect growth to come from by 2025. Another area of impactful change identified by the study is the increasing importance of environmental, social and governance (ESG) issues. More than half of corporate leaders (52%) expect ESG to be the top concern for their business in a decade, while over a third of finance sector leaders (35%) expect it to significantly increase in importance over the next decade. Accordingly, local financial institutions and their corporate clients alike will have to better consider ESG elements, not just to meet the market, but also because it is good business risk analysis and management. The social and governance aspects of a business can have a dire, if not more so, impacts as environmental ones, the study notes. This will also have implications for how financial institutions connect with and care for the communities that they operate in. How financial institutions and companies adapt to what the future brings and how they remain relevant will be critical – and some, large and small, entities will fail to adapt to these changes fast enough. The best solution to future-proofing a business or a financial institution appears to be having both a leadership and workforce that have a continuing sense of purpose in serving client needs, so flexible enough to meet these needs and are able to develop strong client relationships through much better engagement with clients of all types using the latest technology enablers.